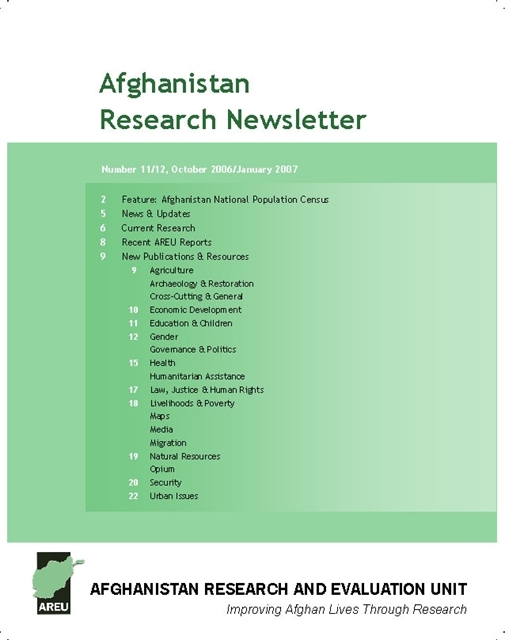 This is the January/February 2009 issue of AREU’s Afghanistan Research Newsletter. It includes the article “Hidden Kabul,” about restoring buildings in Kabul’s old city, by Jolyon Leslie. 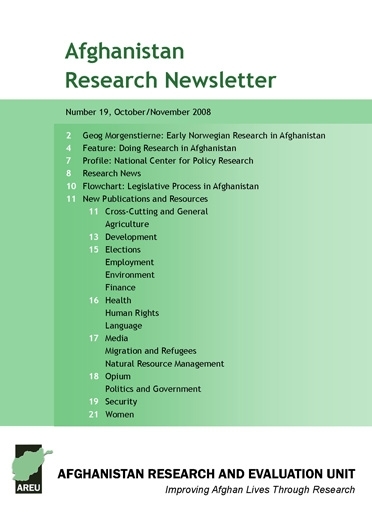 This is the October/November 2008 issue of AREU’s Afghanistan Research Newsletter, featuring an article on Georg Morgenstierne, an early Norwegian researcher in Afghanistan, by Michael Fergus. 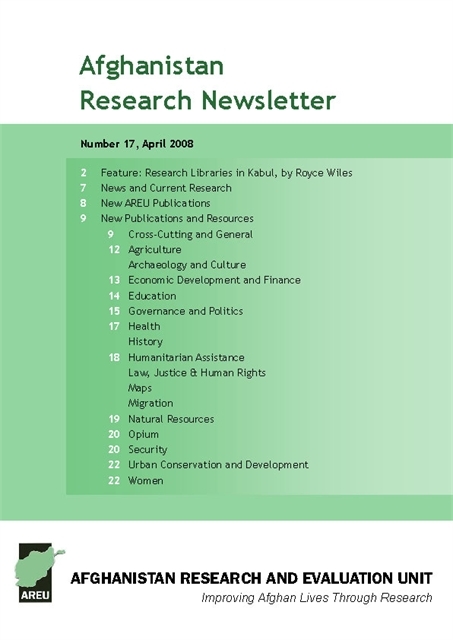 This is the April 2008 edition of the Afghanistan Research Newsletter, featuring an article on research libraries in Kabul, by Royce Wiles. 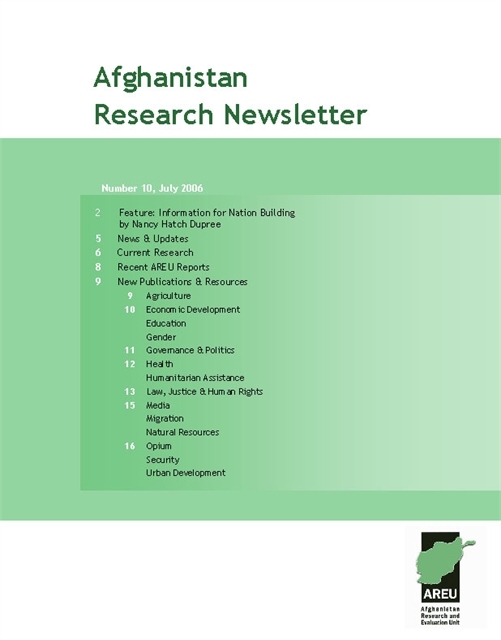 This is the July 2008 edition of the Afghanistan Research Newsletter. It features an interview with AREU’s director Paula Kantor, by Chris Bassett, and an article on Pashto-language publishing, by Jamil Alkozai. 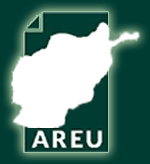 This is the April 2007 edition of AREU’s Afghanistan Research Newsletter, featuring a lead article on mapping in Afghanistan, by Royce Wiles. This is the July 2007 issue of AREU’s Afghanistan Research Newsletter, featuring an article on the registration of Afghans in Pakistan. This is the October 2006-January 2007 edition of the Afghanistan Research Newsletter. 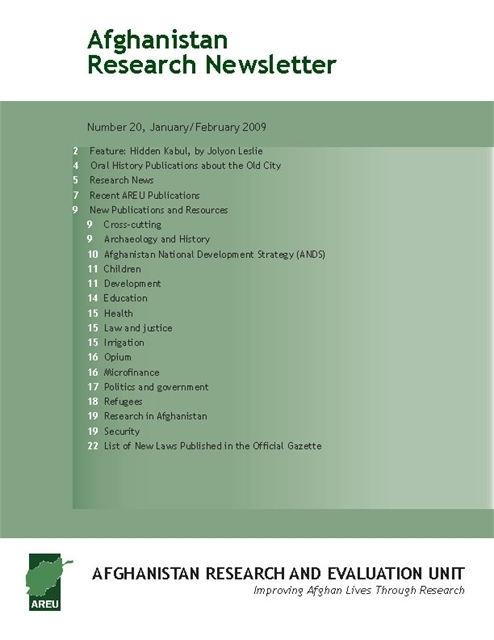 This issue has a feature article on the background to Afghanistan’s national population census. 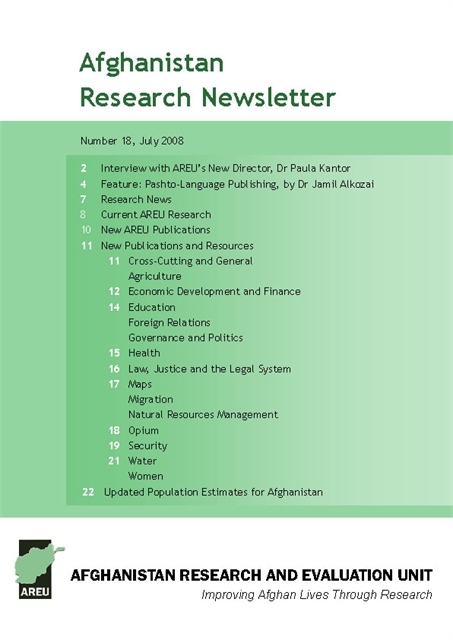 This is the July 2006 edition of AREU’s Afghanistan Research Newsletter. 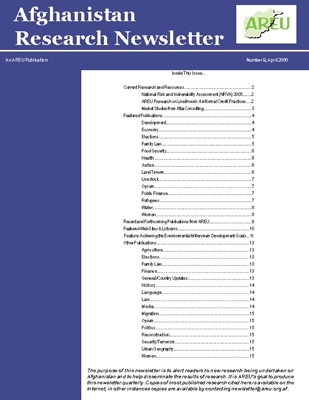 This issue has a feature article on information for nation building, by Nancy Hatch Dupree. 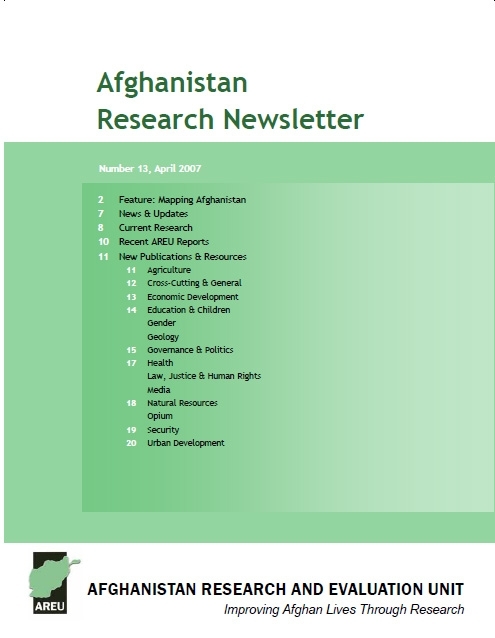 This is the April 2006 edition of the Afghanistan Research Newsletter, featuring the article “Achieving the Environmental Millennium Development Goals,” by Belinda Bowling and Asif Ali Zaidi.